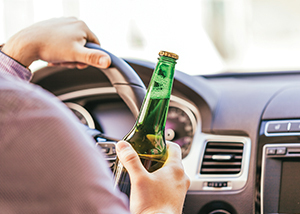 Most people know that driving while under the influence of alcohol is illegal in Washington, but so too is driving with an open container of alcohol or attempting to disguise an alcoholic beverage. Remember, an “open container” includes any container that has had the seal broken, unless the container is in the trunk. Be safe and put any alcohol far from reach, for example in the trunk. It is a traffic infraction to drink any alcoholic beverage in a motor vehicle when the vehicle is upon a highway. It is a traffic infraction for a person to have in his or her possession while in a motor vehicle upon a highway, a bottle, can, or other receptacle containing an alcoholic beverage if the container has been opened or a seal broken or the contents partially removed. It is a traffic infraction for the registered owner of a motor vehicle, or the driver if the registered owner is not then present in the vehicle, to keep in a motor vehicle when the vehicle is upon a highway, a bottle, can, or other receptacle containing an alcoholic beverage which has been opened or a seal broken or the contents partially removed, unless the container is kept in the trunk of the vehicle or in some other area of the vehicle not normally occupied by the driver or passengers if the vehicle does not have a trunk. A utility compartment or glove compartment is deemed to be within the area occupied by the driver and passengers. This section does not apply to a public conveyance that has been commercially chartered for group use or to the living quarters of a motor home or camper or, except as otherwise provided by RCW 44.250or local law, to any passenger for compensation in a for hire vehicle licensed under city, county, or state law, or to a privately owned vehicle operated by a person possessing a valid operator’s license endorsed for the appropriate classification under chapter 46.25 RCW in the course of his or her usual employment transporting passengers at the employer’s direction: PROVIDED, That nothing in this subsection shall be construed to authorize possession or consumption of an alcoholic beverage by the operator of any vehicle while upon a highway. RCW 46.61.5195: Disguising alcoholic beverage container. It is a traffic infraction to incorrectly label the original container of an alcoholic beverage and to then violate RCW 61.519. It is a traffic infraction to place an alcoholic beverage in a container specifically labeled by the manufacturer of the container as containing a nonalcoholic beverage and to then violate RCW 61.519. Being injured from a drunk driver can often result in unfair settlements. Get the best settlement, faster with the help from the personal injury attorneys at Parke Gordon Law Firm. Our lawyers have obtained impressive settlements for Spokane clients. Contact the law office of Harvard law grad Mat Parke today for a free consultation about your car accident case.